With makers designing more-and-more wireless devices, there is a greater need for manufacturers to develop wireless capable prototyping boards. One of the favourite methods of wireless communication is Bluetooth. The latest Bluetooth 4.0 is low-power, and has a long enough range for lots of projects. 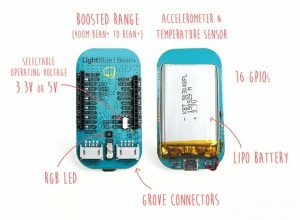 The Bean+ is a new board developed by LightBlue, that features low energy Bluetooth, a rechargeable Li-Po battery, and 16 GPIOs. Based on Arduino, the Bean+ is programmed wirelessly via Bluetooth from a Windows, OSX or Linux machine. Not only does the Bean+ have a built-in battery, but it also features an accelerometer and a temperature sensor. If you are going to use these sensors in your projects, it is advantageous to have these built into the board. The Bean+ also features a switchable voltage; 3.3V or 5V. The 600mAh rechargeable battery, can supposedly last a full year using a low power sketch, allowing you to create truly set-and-forget projects. The Bean+ also features a USB port for handy charging. This USB ports is not used to program the board, all programming is done wirelessly. The board features standard 0.1″ female header pins, along with the Grove connectors by Seeedstudio, for connecting with the rest of your project. The Bean+ can act as any type of USB device. It can be a MIDI controller, a mouse or keyboard, and can connect seamlessly to an iPhone, using the LightBlue app. LightBlue have also developed SDKs for Android, iOS and OS X. The Bean+ boards can communicate wirelessly with each other, using a boosted signal for greater distances. The Bean+ can become a wireless MIDI controller! 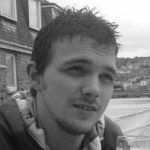 The LightBlue community is active and there are many projects that can be modified to use the Blue+ board. This not only includes sketches, but also apps to use on your smart phone, along with the Bean+. The Bean+ is a great alternative to the Uno + BT shield method. With its rechargeable battery power, and built-in sensors, the LightBlue Bean+ is a great little development board. LightBlue have launched a Kickstarter campaign, looking to raise $30,000. The great news is that the target has already broke $100,000, so for just $39 you can get your hands on your very own Blue+ board.